GOLD achieved our 2nd Price Objective as pointed out in our 23-December 2018 Post. 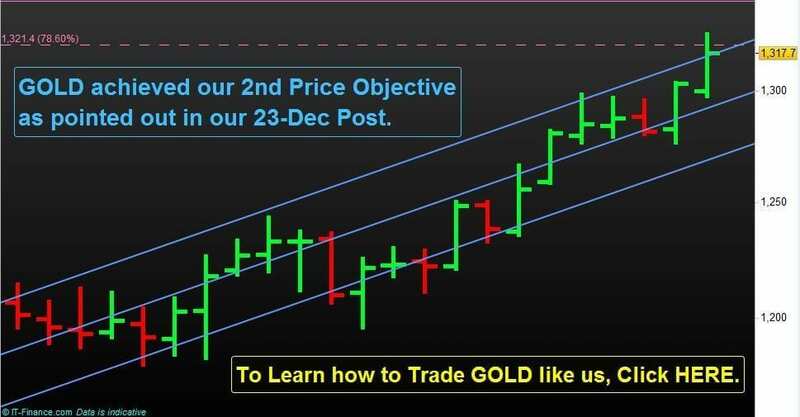 In our blog post dated 23-December 2018 just 2 weeks before, for price objective of Gold from our technical analysis for Gold, we wrote, “In this blog post for Spot Gold, we have highlighted the future price objectives of Spot Gold at <1> 1,287 as price objective level 1, <2> 1,321.4 as price objective level 2”. Just after 7 days after our post on Gold, Gold achieved our second price objective smoothly at 1,321.4 level on Wednesday 30-January 2019 after reaching our first price objective at 1,287 level on Friday 25-January 2019. Our posts’ price objectives were so definitely accurate. This is only because since we Trade for our leaving. In our blog post dated 23-December 2018 just 2 weeks before, for price objective of Gold from our technical analysis for Gold, we also wrote for the 3rd price objective as, “1,349.9 as price objective level 3 as marked in the above weekly chart”. Our Proprietary Commodity Trading Strategy will guide you through Our Power of Scientific Method of Market Analysis every step of your trading in a commodity like Spot Gold and explore the possibility of earning extra income. Learn what all other Commodities we are Trading in our Commodity Trading Asset Class. Develop yourself as a professional trader capable of capturing extra income in the future with us. Trade Commodity Spot Gold Market as a contract for difference through Our Power of Scientific Method of Market Analysis. In our blog post dated 14 October 2018, we wrote, “If the price of Spot gold (XAU/USD) Market in the coming week i.e. week number 42 (from 15.10.2018 till 19.10.2018) goes above 1,226.5 level then it can be considered to go up further”. As per our above price objective writing for Spot Gold in our blog post dated 14 October 2018, price indeed went above the mentioned level of 1,226.5 level in the said week number 42 (from 15.10.2018 till 19.10.2018) and closed at the level of 1,226.8 with a high price printed at 1,233.4 level. Point to be noted here is, both the prices (close price as well as high price) of Spot Gold actually went above our mentioned price level of 1,226.5. Exactly as per our price objective writing for Spot Gold in our blog post dated 14 October 2018, price indeed went further up and now the price of Spot Gold is at 1,255.8 as shown in the weekly chart. 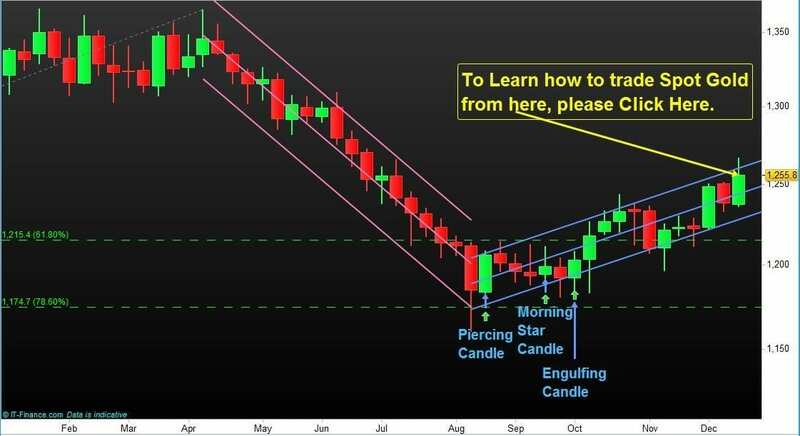 3> Bullish “Engulfing Candle” plotted in 01-October 2018 which was week number 40. After this, there was no looking back. It is continuously printing higher peak on 22-October 2018 which was week number 43 and higher troughs on 12-November 2018 which was week number 46 and another one on 26-November 2018 which was week number 48. 2> 1,349.9 as price objective level 3 as marked in the above weekly chart. Spot Gold (XAUUSD or ) has exactly bounced from our level posted in our blog post dated 14 October 2018. In our blog post dated 14 October 2018, we wrote, “If the price of Spot gold (XAU/USD) Market in the coming week i.e. week number 42 (from 15.10.2018 till 19.10.2018) goes above 1,226.5 level then it can be considered to go up further”…..
DAX-and-DJI Technical Analysis: Germany 30 Stock market index (DAX) is down since last 5 months as shown below. As can be observed from the below chart for Germany 30 Stock market index (DAX), DAX is printing bearish (close price is below open price) candles for the last 5 months consecutively…. In our last post dated 7th October 2018 on “Future Price Objective of Bitcoin Crypto-Currency: XBT/USD” we wrote, “Now if the close of Bitcoin Crypto-Currency is staying above or below the said 2 support and 2 resistance lines then there is a possibility of a price move up or down respectively”…. Commodity Lumber has lost a massive 34,841 points in the last 6 months. Commodity Lumber had printed the lowest low in January 2009. That low value which Commodity Lumber printed in January 2009 was 13,790…. Are you observing what is happening to Shares as per our Blog Post @ Oct 28, 2018? In our Blog Post dated Oct 28, 2018, we observed and highlighted a lot of technical signals which were pointing to a possible start of a Bear Market in Stock and Index Trading. We only analyze the situation as it is happening NOW in the world stock marketplace which is also affecting the Index Trading worldwide in a big way…..
Australian Dollar- AUD/USD Technical Analysis: In this post, we have highlighted the possible move of Australian Dollar (AUD/USD) with the help of our Technical Analysis as shown below. The charts shown here are monthly and weekly time frame charts of the Australian Dollar (AUD/USD) Forex currency pair…..
Commodity Crude Oil is exactly behaving as per our Blog Post dated 30.09.2018. In our Blog Post dated 30.09.2018 for Commodity Crude Oil, we correctly identified the Top Reversal Pattern. The identified Top Reversal Pattern for Commodity …..
Forex Pair GBP/AUD behaved exactly as per our Blog Post dated 21.10.2018…. We are observing a lot of technical signals which are pointing to a possible start of a BEAR Market in Stock and Index Trading. We only analyze the situation as it is happening NOW in the world stock marketplace which can effect Index Trading worldwide in a big way…..
Technical Analysis of Sterling Aussie (GBP/AUD) Currency Pair: In this post, we have highlighted the possible move of Sterling Aussie (GBP/AUD) Currency Pair with the help of our Technical Analysis as shown below. The chart shown here is a weekly time frame chart of the Sterling Aussie (GBP/AUD) Currency Pair…. Future Price Objective Analysis for Spot gold (XAU/USD): In this post, we have highlighted the possible future Price Objective Analysis for Spot gold with the help of our Technical Analysis as shown below. The chart shown below is a weekly time frame chart for the Price Objective Analysis for Spot gold currency pair….